You are a map maker and GIS guy…did you research enough to know this pipeline will be installed at a depth that would make a breach with the water table nearly impossible? Some article! Scare tactic headline and not much content. You are part of the fear mongering problem! Not impressive kid, sorry. Thank you for prompting me to do more research. The depth of the pipeline under the river does not entirely alleviate concerns about a spill’s impact on the river, since this light crude could flow into the river from any surface breach within the river basin. However, since you mentioned the water table, I did some more looking into the local aquifers, and came across this extensive 1988 USGS white paper: https://pubs.usgs.gov/pp/1402a/report.pdf. If you examine Figure 4 on page A6 (page 15 of the PDF document), you will see that the aquifer underlying the Missouri River is several hundred feet thick. I believe the plan is currently to drill up to 90 feet below the river. And I am 34 years old. I read that “Federal Land” will be closed 12/5/16, and all the protestors encouraged to leave. Could you amend your map to show where this so-called land is? Is it next to reservation land? Are the private security “forces” operating on reservation land? Or, are the protestors going out of their reservation land to protest? I am working on a separate map showing the boundaries of U.S. Army Corps land, which the Oceti Sakowin camp is on, as time permits. Not fear as much as acknowledgin, what they are planning on doing. Intriguing argument. My simple response is: If the proposed depth is of no consequence, why has it’s path been altered? Matthew, that’s exactly what I wondered. Has the path been so altered? How is this claim documented? And even if it is so perhaps it was altered so as to use the easement already there. Or to use a crossing in a spot on federally controlled access. According to Court filings the route was redirected over 200 times…. to avoid Native monumentation. There are commital monuments all over these several states and these cannot be disturbed even if on privately held land. (The Sioux, being nomadic, did not maintain burial grounds). Should have just proceeded with the original route right past Bismarck. You would not have had any problems at all. Well, except for the community rejecting it on concerns of a line spill. Everyone has the right to clean water, including the people of Bismarck. The solution in my opinion is to keep the oil in the ground and use this country’s vast stores of ingenuity to transition away from reliance on fossil fuels. Continuing to build oil transportation infrastructure instead reinforces our reliance on oil and makes the terrifying “business as usual” climate change scenario more likely to come to pass. nearly impossible! not good enough for me. Remember the Titanic was UNSINKABLE! I agree with this comment. Stick with cartography because it seems that objectivity is foreign to you. For example, your article could carry much more weight if you explore the consequences of not building the pipeline. We are seeing now here in the Twin Cities, where hundreds of tanker cars with ND oil pass through already congested freight rail yards. Some of these rails run through towns and even up tight to the Mississippi River. Or maybe a discussion about pipeline transport in general? There are thousands of miles of pipeline underground carrying a variety of liquids without incident on a daily basis, such as sewage, water, natural gas, and, yes, even refined oil products. Magellan, for example, has a pipeline here in the Twin Cities that carries gasoline and diesel from a local refinery to a tank farm about 20 miles away without incident. And the pipeline runs through residential neighborhoods! So yes, your article is scaremongering and uninteresting and your opinion casts doubt upon your research. Thank you for your thoughtful perspective. You are correct that I am not interested in pretending to be objective about an issue that I care very deeply about. Although I think it’s a little much to expect someone to be an objective journalist in their personal blog, I will point out that even the editorial boards of major media outlets we would expect to maintain “objectivity” (e.g., the New York Times, Houston Chronicle, etc.) have opined on the Dakota Access project. Everyone has a perspective. That doesn’t mean that perspective can’t be informed by facts, and I do my best to rely on facts to support my arguments. Finally, I mean no disrespect, but if you found my article so “uninteresting,” why did you bother commenting on it? Thanks for using your talent and passion to expose what is happening in Standing Rock. I would love to see something similar done with the hog production farms happening in eastern NC. Environmental racism is real and in full effect all over our nation. It would be great if you just did a cartography of all of the Pipelines too. What is it, 8 total? Doesn’t require an article about whether or not you feel they are good, just information on how you found data and how you designed the data. Finding pipeline data isn’t easy. I traced these from the DAPL Environmental Assessment, which is on the Army Corps website. This is extremely frustrating. Opponents are asserting that there is precedent with natural gas line just north, as well as 8-41 other pipelines that cross the Missouri River. We really need a map and more info on those lines and the circumstances as case studies. Can you create a map with the other pipelines? I have spent hours investigating but haven’t gotten very far. There have been a number of requests for a map with other pipelines in the area, which I just don’t have time to make at the moment. I may in the future if time permits, but I’d welcome anyone else to make one in the mean time. As far as precedent goes, I doubt there is anything substantially similar to a pipeline designed to pump 470,000 barrels of crude oil per day, which large enough that it is slated to put oil-by-rail from the Bakken out of business. there are maps already out regarding other pipelines. Would be interesting to see these on your map. Reblogged this on John Edward Marin. This map is very nice, and I’d been looking for something like it so thank you. However, one question it raises: What is the 1851 Treaty of Fort Laramie and is it still relevant? You feature that boundary very prominently on the map but don’t give much of an explanation for what it means, or what “unceded” land means. Some reading on wikipedia https://en.wikipedia.org/wiki/Treaty_of_Fort_Laramie_(1851) indicates that there have been treaty violations on both sides (surely more on the part of the US, but also by Lakota attacks on other tribes that were included in the treaty). Do you have any more insight into what that boundary actually means on a map of the world in 2016? Also, I’m glad I read through these comments, because it does seem relevant to know that there are existing pipelines in the area, even though your map makes no indication of it. If you are not interested in being neutral (which you’ve said in the comments and is fine) it seems a little disingenuous to knock the company’s own biased small-scale map without pointing out the limitations of your own. The real question though: ArcMap or QGIS :)? Thanks for bringing cartography to huffington post!! I appreciate the comments. I’m still learning about the treaty myself; I understand that in this particular geographic area it was never legally superseded or abrogated, though what that means to courts today I think is an open question that is currently under some scrutiny. I’d like to see a map of all the pipelines in the area too; I’d also like all of the U.S. pipeline data to be public, which it’s not. I don’t quite understand how choosing to tell a particular story with my map–and clearly stating what that story is–makes critiquing the company’s map disingenuous. And I use both programs regularly; this project used Arc just because some of the government data I started with was in ESRI Geodatabase format. Thanks for the response, I appreciate it. Just looking at the treaty itself, Article 8 http://digital.library.okstate.edu/kappler/Vol2/treaties/sio0594.htm#mn15 seems like a pretty basic “void if violated” clause, but that’s absolutely as far as I could comment on it. I guess the point is that seeing the treaty boundary on the map raised more questions than it answered for me. I second your feeling about public pipeline data; I haven’t ever had to look for it though so I didn’t think about whether it would be available or not. It would still add a lot to the map, or at least a note about it’s omission. As for criticizing the company’s own map, I completely agree with you that it’s pretty light on substance and the symbology bizarre (perhaps suspicious), though I do see now that at least they published larger-scale, state-by-state maps which are a tiny bit better… Now that I’ve read the paragraph that they published underneath the map, I agree with you more (they tout the route’s efficiency and concern with it’s affected citizens but don’t use the map to support any of that). Thanks for your work. All of us fighting pipelines need such help and we need to stop letting ourselves be bullied by companies. Thank you for sharing this! I’m currently doing research about the Dakota Access Pipeline for my AP Seminar high school class and was wondering if I can use this article for my paper and presentation. Do you mind contacting me or if I were to contact you regarding the article and credibility? For every source I use I must explain the credibility of each article, and so far, this is one of the best I’ve seen. My email is matthewbmagno@gmail.com . Thank you again! I’ve been looking for a good overview for some time, so thank you for that map! There is, however, one thing missing from it that I would appreciate. I’d have liked to know not just where DAPL stopped on Sept 3, but where they were on Sept. 2, or Sept. 1. I’d like to get a sense of how fast they were moving forward with the pipeline. The distance between the Sept 3 line and the bulldozed sites is hard to appreciate without some sense of velocity. If I could find that data, I’d add it in a heartbeat. The first map I found was the pink lined one. I am so glad to see I got attention. Lol not really but, your right about a fault in their statement of depth the can accomplish. I feel they are not waiting for permits to begin. Thus, already started. Thanks for this map, I would like to use it to contrast the Energy Transfer map in a paper I am putting together. I would like to cite you appropriately and wonder if you would be able to give any other information (for citation) other than Northland Iguana at your wordpress web address. If you don’t mind, would you email me? I’m interested in learning more about what is happening at Standing Rock. 1) How is it that developers of the pipeline were able to access Sioux lands deemed “unceeded”? 2) Why was the tribe not include or given the opportunity to be involved in any pre-planning / waivers, etc.? 3) How did congress violate the treaty of 1851? Where can we find / view a copy of the treaty of 1851? 4) Does the tribe have an official page / website that can bring people up to date on the facts of this debacle? Active link here to the Court’s findings. From there one can go back and review the arguments presented by the Standing Rock interests. Please. Read the court proceedings, including the affidavits submitted on behalf of the Standing Rock Sioux. Americans go to great trouble and expense to maintain a smart and perceptive judicial system. The highly qualified judge (appointed pursuant to nomination by Pres. Obama) reviews the documents and renders a decision. Then, one would suppose, every citizen is free to just disregard all of this and inveigh on the basis of claims he does not pretend to understand. Thank you for this perspective. The court case in question (Standing Rock Sioux Tribe v. U.S. Army Corps of Engineers) is still ongoing. The decision linked to from the article you posted was the denial of a preliminary injunction to halt construction on the basis of claimed violations to the National Historic Preservation Act. From the finding: “[The tribe] has now filed a Motion for Preliminary Injunction, asserting principally that the Corps flouted its duty to engage in tribal consultations under the National Historic Preservation Act (NHPA) and that irreparable harm will ensue. After digging through a substantial record on an expedited basis, the Court cannot concur” (emphasis added). This finding is far from the final word on the case. For the full context and timeline of the case, please see http://earthjustice.org/features/faq-standing-rock-litigation. I appreciate your map. I am trying to understand if Sioux lost the Unceded Indian Territory North of Cannon ball river to Heart River in the 1868 treaty. From my observation, it doesn’t say anything about the Unceded Indian Territory North of the South Dakota Northern boundary in the 1868 treaty. Does this sense? I know that the 1851 Treaty does, but does the 1868 treaty relinquish their rights to the Unceded Indian territory north of the Great Sioux Reservation to the Heart River; north of Cannonball River? Thank you for bringing this up. I have issued a correction to the map and blog post, which is now described at the bottom of the post. This is complicated and fraught legal history; I am not a lawyer, and it has taken me many hours of reading and digging through old legal decisions to feel like I’m starting to understand the course of it. I took another look at both treaties and the Indian Claims Commission cases that interpreted them. It does appear that this area was both ceded under the 1868 treaty terms and treated as such by the ICC. I have also spoken to one expert in the history of Sioux-U.S. legal issues, and have reached out to Standing Rock tribal attorneys for their perspective as well, but have not yet heard back. It is important to note that some bands of Sioux, including those led by Sitting Bull and Crazy Horse, fiercely dissented from the terms of the 1868 treaty; Red Cloud signed it, but later claimed he was lied to about it including terms of cession in meetings with politicians in Washington and a speech to philanthropists in New York. However, it was signed by a plurality of Sioux chiefs at the time, and the U.S. Supreme Court in 1980 references the 1868 treaty–not the 1851 treaty–in its ruling that the U.S. took the Black Hills without just compensation. From a cartographic standpoint, this is an example of maps being subject to the same sorts of human error as writing or any other endeavor. The accuracy of the information included on my maps is very important to me, and I regret the error. Nonetheless, I stand by the map and blog post’s key assertions in regards to the overall injustice of this pipeline. Hi Carl! Are you willing to share the .lpk of your data? If you’re interested in getting it out there, consider posting on http://www.databasin.org. I am not sure what a .lpk is. This map was made using ArcMap and Adobe Illustrator. I’m happy to have the map posted there if it can ingest a PDF or AI file. Thank you for the links above, lpk is an ArcGIS layer package, which contains the shapefile/feature class, as well as symbology (right-click in TOC and click Create Layer Package). There is also a map package (mpk), which would put all the layers in your map document into a single file (File > Share As > Map Package). Makes for an easy way to send several spatial datasets all at once. The GIS user community would benefit most from the original datasets used, rather than the PDF or Illustrator file. Thanks in advance, if you decide to share! The court’s decision on the preliminary injunction was not cited as authoritative. It clearly rejects the Standing Rock contention that they were not consulted. That is unlikely to change on the basis of the record to date. As to Earthjustice commentary, be sure to consider that this is the voice of the law office conducting the fight for Standing Rock. The Court, of course, hears BOTH sides. Chris, by their very nature preliminary injunctions are decided on a limited evidentiary basis and in an expedited manner. The burden of proof is extremely high for anyone seeking a mandatory preliminary injunction – higher than the criminal “beyond a reasonable doubt standard. Accordingly, the likelihood that Standing Rock’s motion would be granted was nearly 0 & the fact that the judge denied it portends nothing. Until all the evidence is in, your belief about the future outcome is meaningless other than as evidence of your bias against indigenous people. Ms. Pamlam: You mistakenly refer to “burden of proof”. BP has no bearing on this matter. The burden in this instance is procedural. The petitioners failed to discharge their burden of showing likelihood of success on the merits, and also the immediacy of harm. In either case, of course, the BP would have been predominance of the evidence. I take it you have not read the federal district court’s September denial of the petition. The petitioners appealed the denial to the D.C. Circuit Federal Court of Appeals and — again — the petition was denied. How odd it is to be impugned by people who choose not to understand that the Courts are applying the law in accordance with their Constitutional duty, and have carefully analyzed the representations and arguments of the respective parties. You may find all the documents of reference via the website of the attorneys for the Standing Rock Sioux. We must disenthrall ourselves and then we shall country. And the Nations it contains. While I agree with your sentiments on the routing, I would argue that you are sorely mistaken on the need for liquid fuels. You state “We don’t need more fossil fuels making it to market to be burned and burn the planet up in turn” and in that you are wrong. Even in a best-case scenario with government and the private sector working hand-in-hand we are not going to see significant decreases in oil consumption for 20-30 years and in the interim we will need liquid fuels. Thus the safe transportation of those fuels is a necessary consideration in any long-term planning. Many environmental activists argue that we need to get off fossil fuels right away, and while that sentiment is admirable it collapses when confronted with the reality that we do not have any real alternative for fossil fuels for the transportation sector. We lack the electrical infrastructure to electrify personal transportation (we don’t produce nearly enough electricity to power the electric vehicles) and we lack the technologies to electrify the heavy truck, train, transport ship or aviation sectors. So until we come up with a way to make a combine harvester that can run all day on batteries or a container ship that can run off wind we will need the compact energy source supplied by fossil fuels because if we were to eliminate our use of fossil fuels tomorrow the result would be starvation, untold human suffering and ecological destruction on a planetary scale. I appreciate the perspective, and agree that a transition away from liquid fossil fuels will take time. However, it needs to start now, and it needs to be a massive effort on the scale of the Marshall Plan. If we can invent self-driving cars, we have the ingenuity to do what needs to be done to save the climate. The alternative is, to borrow your words, starvation, untold human suffering and ecological destruction on a planetary scale. That’s not hyperbole–it’s newly published science: http://www.hawaii.edu/news/2016/11/09/a-new-study-concludes-warm-climate-is-more-sensitive-to-changes-in-co2/. There are people looking at exactly what the technical details of this transition would be and how it could be accomplished. Check out the Solutions Project, which puts this research into easily digestible infographics: http://thesolutionsproject.org/. Are you heavily invested in Solution Project enterprises? If not, why not? Solutions Project is an idealization assuming away practical considerations and tradeoffs. That was NOT the case in the Marshall Plan, which emphasized the practicalities of market driven economics. Science, moreover, is what one makes of probabilities; what we learn by applying the scientific method invites us to appreciate likely outcomes. It does not, generally, assign costs to changing probabilities and appreciations; assigning costs is the function of the marketplace and of regulation. It is a long reach from the Sioux treaties to the global environment, with considerable costs either way. See, for example, Krech, The Ecological Indian (Norton 1999). As to what you have written on the Solutions Project, links would be helpful. Many of us have indirect investments in energy enterprises by way of pension plans and other asset management schemes. Standing Rock Sioux confrontation on the DAPL is not going to dissuade the investment community regarding the ongoing North American development of energy resources. How can we build windfarms without fossil fuels to do the fabrication of the components? Here in PA we have depended on our energy infrastructure to erect our considerable wind farms. Your map, although impressive, is completely irrelevant and out of date. Please do your research. The said parties hereby agree that the northern and western boundaries of the reservation defined by article 2 of the treaty between the United States and different tribes of Sioux Indians, concluded April 29, 1868, and proclaimed February 24, 1869, shall be as follows: The western boundaries shall commence at the intersection of the one hundred and third meridian of longitude with the northern boundary of the State of Nebraska; thence north along said meridian to its intersection with the South Fork of the Cheyenne River; thence down said stream to its junction with the North Fork; thence up the North Fork of said Cheyenne River to the said one hundred and third meridian; thence north along said meridian to the South Branch of Cannon Ball River or Cedar Creek; and the northern boundary of their said reservation shall follow the said South Branch to its intersection with the main Cannon Ball River, and thence down the said main Cannon Ball River to the Missouri River; and the said Indians do hereby relinquish and cede to the United States all the territory lying outside the said reservation, as herein modified and described, including all privileges of hunting; and article 16 of said treaty is hereby abrogated. I find it interesting that you quote the Treaty of 1868 in your comment below, yet gloss over the part that declares that international treaty in force until changed by agreement of 3/4 of the adult male Sioux population (Article XII). The 1877 Act of Congress that stole the Black Hills did so in violation of international law. The “agreement” of 1876 codified by the 1877 law was only ratified by about 10% of the Sioux. In 1980, the U.S. Supreme Court determined this law to constitute an illegal taking in U.S. vs. Sioux Nation, 448 U.S. 371. I appreciate your engagement with this issue and your perspective; however, if you are going to challenge my research, please do a more thorough job of your own. For all of you who are against pipelines, how do you suggest we transport oil, gas and other NECESSARY things in the 21st century? Or perhaps you NEVER drive a car, ride in a taxi, use any kind of mechanical device (everything that moves needs lubrication and that usually comes from crude oil.) Even your bicycle required oil to make it from the tires to steel or aluminum to seat and cushion. If you do not want to use oil you will have to go back to the stone age. Even the Amish need what oil creates. And for those of you who think I am a troll or oil shrill, I am a retired electrician who now lives in the Philippines. I get NOTHING from anyone but my pension. Obviously it will take a while before we transition to fully renewable energy sources and fully electric vehicles, but that transition needs to start yesterday. Some say pipelines prevent spills caused by accidents in transporting by truck or rail. Others say that the volume of oil spilled during a single rupture is significantly greater than the volume of oil spilled during one or even several truck or rail transport accidents, and usually accidents using these traditional methods of transport aren’t near water sources, unlike pipelines. No one is saying get rid of all oil including lubrication. Lubrication is tiny compared to the amount of oil used for FUEL, which is what we’re talking about. Keep using oil for lubrication, but no one burns lubricating oil because that defeats the purpose of lubrication. We’re saying get rid of the burning of oil, not oil itself. Nice looking map. Unfortunately you wasted your time making a map that is outdated and misleading. Maybe you should do your research better next time. The 1868 Treaty changed these boundaries on the west and south, but did not nullify the northern boundary of Sioux territory as designated in the 1851 treaty. Yes, no problem at all. There is in fact a CC-BY license attached if you look at the small-print source information in the legend. If you click on the map image at the top of the post, there is a higher-resolution PNG file, and there is a link to an even better-resolution TIF at the bottom of the post. Did you ride a horse, a bike or drive in an electronic car today? I’m sure the majority of the people who agree with this didn’t either. We don’t need more oil, really? This country is built on oil. We are the first to consume, but the third to produce. This is super fascinating stuff. I really liked the line about “the side with the best maps wins”. Quick question for you, and I apologize for its vagueness: if I were a complete green leaf with map-making, but I was interested in cartography for the purposes of economic justice, is there a place I could turn to in order to learn more? I’m most specifically interested in ways to map cities and divides between town and country (rural vs. urban) and how to map class divides, but I’m also interested in supply chain mapping (which I’m taking a course on right now). Let me know if anything comes to mind. Thank you so much! Wonderful resources. I’m definitely going to keep posted on your blog more continuously, too. And thank you also Earl! In other words, the government is going beyond what is actually required to revisit the issue. They didn’t fail. It’s a complex situation, and one that should be laid out geographically. For more people to understand, including the camps that are legal (authorized by permit) as well as those that aren’t. Good start, and don’t get too wrapped up in treaties. There is no doubt that there are irregularities in the past, but there was also significant reduction in Indian land on that reservation through a process known as allotment, including the General Allotment Act of 1887 and other similar acts. https://www.iltf.org/land-issues/land-loss I have all of it somewhere, but not handy, and couldn’t find specific maps for ND, on line at least. My understanding of the court rulings so far is they have only dealt with consultation under NHPA, not yet in regards to NEPA, which is the other part of the case. There is also disagreement about what constitutes adequate tribal consultation–which is directly cited by the joint statement you link to, declaring a period of government-to-government discussion with tribes around how to better implement the consultation requirements in federal law. As I stand definitively on the side of the Standing Rock Tribe on this issue, I’m inclined to forward their argument that the consultation process undertaken by the Army Corps for this project was inadequate. I also have to respond to your directive to not “get too wrapped up in treaties”–this is exactly the colonial mentality that has resulted in so many broken Indian treaties over the decades and continues to result in disregard for Indigenous people’s rights, as starkly demonstrated by the actions of Dakota Access and the Army Corps. It is absolutely time to reexamine the international treaties the tribes signed with the U.S. in good faith and what they guarantee in terms of land tenure and other legal rights that have been trampled on by the government but not forgotten by tribal members. I didn’t talk about the NEPA process, only the NHPA process. And the consultation was decided by the court to be clearly adequate, and your article says it’s not. That said, the administration chose to do more, which is good. But that doesn’t mean the NHPA consultation wasn’t adequate. It is a hard process and difficult culturally. As for treaties. My response wasn’t about supporting colonialization, but rather a nice way of saying that they are incredibly complex, with over 100 years of court battles and additional laws (most descriminatory and few on the web) that someone who isn’t a land law or tribal land lawyer should probably not be making calls on (such as your use of the word “unceded” in yourmsp). I also support the tribe. I don’t support inaccuracy or maps that show more certainty than is really there. Because then it is not that those with the best, most accurate, map wins. It’s those with the map that appeals most to people’s confirmation biases wins, and that isn’t best in any sense except in how it makes people react viscerally. Maps should be accurate, and by not knowing tribal land law you may not be portraying what is reality, but rather what you think should be. I don’t actually disagree with you, but there is so much to consider, as well as a clear and defined system of dealing with tribal land claims that you are skirting in favor of showing someone’s interpretation of a treaty from over 150 years ago. You might be right. The tribe might be right. But neither is in a position to make that determination without expert advice and a long legal process. There is enough misinformation being spread about this issue. No matter your position on it, I would encourage you to work for accuracy as a long term goal, not winning hearts and minds temporarily with slight errors and purposeful manipulations of the facts. Thank you for the discussion. One naturally expects that the treaty disputes — such as they may be — will be presented in court by counsel for the protesting petitioners. Counsel of record is Earthjustice, whose website solicit tax free contributions from the interested public. Apparently that does not transgress the canons of professional ethics in a case such as this one. But who, then, is the actual client? Chris, the client is the Standing Rock Sioux Tribe. I don’t know if Earth Justice does tribal treaty law. If they don’t, there are others. And yes, they can fundraise to provide their services, and the tribe is fundraising to pay their legal expenses, too. The treaty will be something completely different from the current case, which is SRST v. USACE. Their legal library is a good collection on the NHPA and NEPA issues in court now: http://earthjustice.org/library/?f%5B0%5D=im_taxonomy_vocabulary_7%3A790&f%5B1%5D=bundle%3Afile). The treaty case (if there is even a case, which I question based on my reading, although the information I can find is incomplete) would be a totally separate case and will probably take many years to complete. The problem with relying on the 1851 treaty for information about rights is that there was subsequent allotment of Indian lands on that reservation. This forced a lot of lands out of Tribal hands and eventually into private ownership. The map above doesn’t deal with any of that, and assumes the 1851 treaty to be the end document, which isn’t true. Allotment sucked for the Indians – don’t confuse me for an appologist for what the government did. But it also changed the land law of the reservation and the 1851 treaty (and many others across the nation) and ensured the best agricultural land ended up in the hands of whites. The whole issue is a cluster and dealing with it, if the government is even willing, may take decades. I doubt, based on the fact that so much of the land is private that they will do that. When it is in public ownership, like national forest or national park, it’s much easier to work to provide for traditional cultural activities on the land in question. When it’s private homesteads, I have a feeling our government and courts will be slightly less willing to even broach the issue. Earthjustice lawyers are counsel of record in the pending pipeline dispute. If so they are ethically oblige at least to counsel their clients of their rights to bring action or engage cocounsel to advise on treaty issues, if any there be. Either counsel or client have so far declined to press a legal claim on the treaties. The courts, of course, will not “broach” questions unless they are presented by parties in interest. I.e. clients. Not being either a North Dakota or California lawyer one can only ask about the ethics of soliciting contributions to finance one’s legal fees. As to treaty claims, it will be interesting to review the law library. Nevertheless —if the public is to have a policy interest it is likely to turn on historical questions more than aspirational imperatives. Pingback: Readings for the Pipeline Protest – Escape Reality, Read Fiction! Thank you for the link. What’s viewable by the general public is fairly limited and can’t be downloaded, but I imagine you could start here and trace screen captures. That’s from a passing comment that I doubt was published in any form. I would direct you to the work of some critical cartographers and historians of cartography such as Denis Wood, J.B. Harley, and Bill Bunge. Zoltan himself teaches at Evergreen College and has a list of his writings on his website: http://academic.evergreen.edu/g/grossmaz/. Matt Gardner with the Lake Mills Leader of Lake Mills, Wisc., messaging you. I noticed at the top of your blog what looks to be a map of Enbridge’s pipeline corridor that runs just to the west of the city of Lake Mills. If that is a map of Enbridge’s pipeline corridor, would you be able to share it with me? I’m very curious as to where this pipeline corridor runs through Jefferson County in Wisconsin. Just let me know! Thanks for creating the awesome map on the Dakota Access Pipeline as well. Hi Matt–no problem. I will e-mail it to you. In summary, the pipeline is going to carry an explosive poisonous mixture of chemicals from which “oil” will be extracted at refineries and EXPORTED. FYI regarding Obama Administration treachery: After his Secretary of State Clinton approved the XL pipeline and protests about its crossing our Nations border to traverse the country to refine the tar sands for export forced him to deny permission for the national border crossing, he approved a new policy of “breaking up” a continuous 1000+ mile pipeline into multiple short stretches that do not require environmental review. That is where multiple Corps of Engineers “permits” successfully completed the southern stretch of the XL pipeline under the radar and the current DAPL pipeline has been given multiple Corps of Engineer “permits” the length of North Dakota without consulting the affected towns nor conducting a thorough environmental impact review of the entire length that travels through South Dakota and Iowa to Illinois for refining and EXPORT. I just wanted to say thank you for creating this map and your time on this issue. I found it to be very insightful! I have read that contact was made with local authorities including standing rock leaders, but those on the reservation failed to protest or show concern before the project was started. The people of Bismarck did show concern and their concerns were respected. Do you have any proof that there was/wasn’t contact with tribal leaders (or attempted contact that they refused) before the project started? If opportunity was given, and no one voiced concerns…doesn’t it only make sense to allow the project to continue since cutting it off now would be a huge loss to the company that did all it could to secure permissions? I understand many people would say a “huge loss” isn’t as important as drinking water and understand that but still, if they did everything legally, it seems wrong to stop them now. And wouldn’t that also be a reason other than discrimination/racism for re-routing the pipeline? Have been researching but difficult to trust any source since all are biased one way or the other. Honestly, very few people want to see the Natives mistreated again as they were in the past. But I have to ask why did they wait until now when it would be difficult to re-route? The federal court found, based on acknowledgements by the Sioux and statements by the Corps of Engineers, that there had been numerous opportunities to appear and the Sioux had failed to respond. As to the safety of the water supply, it is perfectly conceivable that an alternate water source can be constructed upstream from the pipeline tunnel, for standby usage if need be. One imagines that the percentages were not in favor of objections to the proposed pipeline until the Keystone pipeline battle was won and funds became available to finance the Standing Sioux objections to the DAPL. “Unceded Sioux Territory” is land that was set aside for the Sioux in the 1851 Treaty, but it was denominated as “unceded” territory in the 1868 Treaty. So, if the “1851” can be deleted, that would be more accurate.” Is there any chance you could make that change and send me an updated version of the map? Please email me at mwagner@earthjustice.org, or call at 415-217-2000. Thank you! And thanks again for this great post! 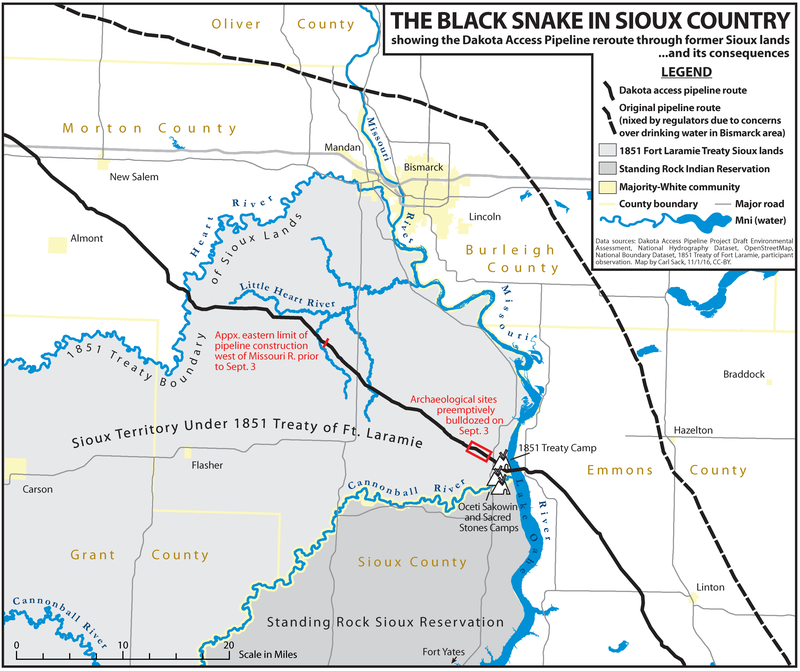 PS In further conversation with the tribes, they recommended simply removing the entire line that says “Unceded Sioux Territory under 1851 Treaty of Ft. Laramine,” and leaving that area defined by the “1851 Treaty Boundary” line. Thanks, and glad to hear that the map could be useful in this regard. I believe the Tribe’s attorney who you quote is mostly incorrect, but he raises an interesting semantic point. The 1868 Treaty says nothing about the land in question; this is most definitely Sioux Territory designated by the 1851 treaty. When I made the map, I did not think the word “unceded” had any particular legal meaning other than “not ceded,” which is the sense in which I used it on the map (here in Wisconsin, we use the term “Ceded Territory” to refer to the lands the Anishinaabe/Ojibwe gave up possession of but retained hunting and fishing rights on in their treaties with the U.S.). However, I’ve since read through a number of Indian Claims Commission cases regarding the boundaries of the 1851 and 1868 treaties, and the decision of July 8, 1970 (23 ICC 358) regarding Sioux hunting lands “north of the North Platte river and east of the summits of the Big Horn mountains” interprets “unceded” to mean lands that were previously given up by the Sioux to other tribes but were taken back by the Sioux under the 1868 treaty terms. However, that decision interpreted Article 16 of the 1868 Treaty as only including land west of the 104th meridian, not the 1851-designated land north of the Great Sioux Reservation. I don’t know of any other decision interpreting this land in light of the 1868 treaty, and it is only shown as 1851 territory on the map of Docket 74 ICC claims. Unless the attorney in question knows something I don’t and can clarify his/her comments further, I will send you a version without the word “Unceded” on it, but keeping “1851”.